Balance issues got you down? (No pun intended). You’re not alone. The list of problems that can lead to an unsteady, unbalanced gait is quite long. Diseases and illnesses, injuries and mechanical flaws, aging, neurological disorders, and more could all be at play. That said, some issues are more common than others. Older people, by far, tend to have the most trouble with shuffling, unsteady gaits. 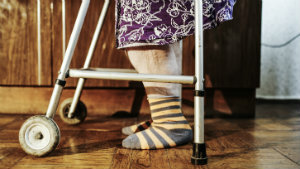 This is partly a natural consequence of aging—as you get older, your muscles and supporting tendons lose strength potential and flexibility, and if you’re not exercising or practicing your balance they may gradually lose the ability to fully support you when you walk without a little bit of a wobble. But unsteady gaits aren’t restricted only to seniors, and aging isn’t the only variable. Injuries can weaken muscles and tendons just like aging can—a series of ankle sprains, for example, can lead to chronic instability as lateral ligaments in the ankle lose their strength. Mechanical flaws, such as flat feet or high arches, could also be a contributing factor. Of course, many neurological conditions could also lead to a lack of stability. Looking at just the feet, these can include foot drop, which prevents you from lifting the front of your foot, as well as general neuropathy—if you lose sensation in your feet, you lose the ability to feel whether or not you’re on solid ground, and that can cause you to lose your balance (as well as gradually change the way you walk into more of a slow shuffle). Moving further up the body, problems such as muscular dystrophy, inner-ear conditions and brain diseases such as multiple sclerosis or concussions can affect balance tremendously. As you can see, a full and careful examination and diagnosis is critical in helping to both determine a cause for gait unsteadiness, as well as a treatment. Dr. Harvey Danciger is happy to provide both for patients throughout the Coachella Valley region. To schedule an appointment with our trained doctor and staff, please call today at 760-568-0108.